Rare, pretty little stones, pearls have held the attention of people for centuries. Pearls are made when a parasite egg or foreign object is lodged inside of a mollusk, which then deposits layers of shelly material or nacre. After years and years, this process eventually creates a pearl. 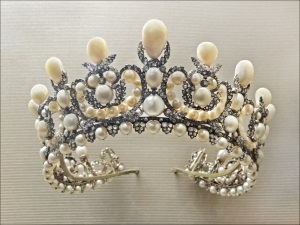 In the era of Queen Mary of England, pearls indicated a rare sign of wealth. Today, however, about 500 million pearls are produced yearly. The Japanese are known for perfecting the process of manufacturing pearls by placing an artificial nucleus for a virtual guaranteed pearl. But, seven hundred years before, Chinese people had a practice of placing little clay figures of Buddha inside live freshwater mussels. A year later, the shells would reveal pearl-coated figurines. A little known fact is that pearls can come in different colors. White pearls are one of the easiest pearls to find, while pink pearls, which only come from the Caribbean conch shell, are the most expensive in the world. They can cost up to thousands of dollars just for one necklace. Even small oysters can produce large pearls. But the larger and older the oyster, the higher the chance of getting a good-sized pearl. The largest pearl ever found on the planet was one and a half inches wide. Before scuba equipment was widely available, divers had to be extremely good swimmers to dive 40 feet below sea level where oysters and mussels can be found. It was extremely unproductive because less than one in a thousand pearls had a good sized pearl. Pearls are harder to get than it looks. So if you think you want to start a pearl business you might want to re-think that please.